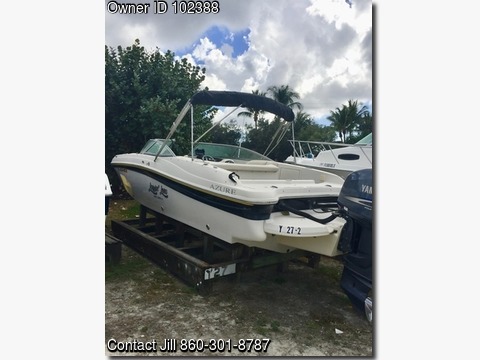 Boat is located in Punta Gorda,Fl.Please contact the owner @ jilltt56@gmail.com...2005 Azure 250 OB 25’6” with a *2012* Yamaha F250 4 stroke (still under warranty until 12/17). This perfect combination of a deck boat/Bowrider and fishing boat! Powered with a 250 Yamaha 4 stroke in 2012 warrantied through 2017 (only 250 hours). Garmin GPS Ecomap 74SV with depth sounder - new in 2015, also in-dash depth sounder, bimini top, docking lights, forward and aft swim ladders, live well and huge fish box, snap in carpet, cockpit table and fold up head, cockpit sink and faucet, two fresh water hand sprayers-forward and aft. New Jensen stereo with blue tooth capability, 4 speakers and wired remote. Includes all recommended safety equipment. 2 VHF radios: Handheld ICOM Model IC-M920.